Winter may be looming but the clear message from our regions is – don't hang your rod up, there's some great fishing to be had, even if you have to wear a few layers. Spawning is slowly getting underway in number of areas, and water temperatures have also dropped down enough to start sparking up our sports fish. As we swing into the months of May and June expect the shoreline fishing on the Rotorua lakes to hot up as spawning gets into gear – especially at the well-known spawning streams and the shoreline spots where Fish & Game has released fish. In Taranaki, recent rains have produced some good freshes in northern ringplain streams and set them up well for trout spawning. You city slickers can even catch fish on Auckland's North Shore – our staff have just stocked up Lake Pupuke with "catchable-sized” trout. The stream mouths around the large lakes like Wanaka, Wakatipu and Hawea will be productive spots as fish congregate before running up to spawn. The West Coast and Southland regions too have plenty of options for winter fishing with a variety of rivers and lakes remaining open. P.S. 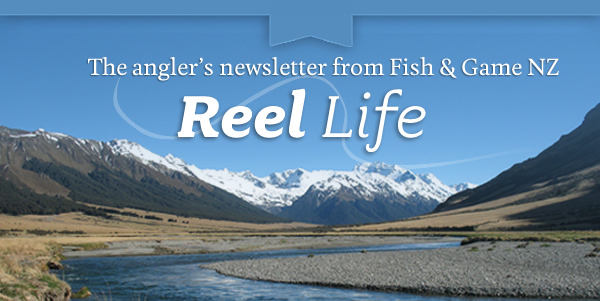 - This month's cover pic shows Fish & Game's Jacob Lucas with a lovely brown from the Motueka River. P.P.S - If you think you've got a freshwater fishing image worthy of featuring on our 'cover', email it to Don Rood for consideration. 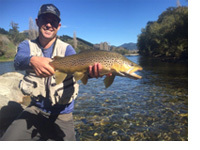 We Kiwi anglers get to fish rivers rated top destinations for millionaires, but without paying a fortune for the privilege. In a recent report from New World Wealth titled Top Destinations for the Super-Rich, Central Otago's Ahuriri River was listed as a top-rated fly-fishing spot.It came in at seventh place, with Snake River in Wyoming taking out of the top spot. Read more here. Anglers, like hunters, have been reassured that their traditional access to fishing spots hasn't been overturned by the new workplace safety laws. There has been concern among anglers and hunters that the legislation could affect access to their favourite spots. Fish & Game and Federated Farmers worked closely together to make sure that recreational access wasn't affected by the law changes. Click here. Winter trout fishing has now closed in the lower reaches of North Canterbury rivers. The closure is aimed at preserving the valued fishery which has suffered from years of environmental degradation. The new rules (effective from May 1) apply to all trout and salmon fishing in waterways east of State Highway One within the North Canterbury Fish and Game Region. Fish & Game has thanked anglers for their support and understanding. Click here. Fish & Game was delighted to recognise the efforts of a group of farmers to protect a North Canterbury stream. The Waikuku Water Management Group is the first recipient of North Canterbury Fish and Game's "Working with Nature Award” for outstanding efforts to improve local freshwater habitats. Read here. The Gamebird Food Festival is on again. Some of New Zealand's best restaurants are again offering game bird hunters the opportunity to have their bag professionally cooked during the 2016 Game Bird Food Festival. Restaurants from Kaitaia to Invercargill are taking part in the Fish & Game initiative which begins on May 7 to promote the variety and quality of wild harvested game. Click here. If you haven't bought a fishing licence, there are still five months from the beginning of May to put it to good use. For $74 for an adult, a winter licence gives you plenty of opportunity to chase trout while they're still in top condition.The licences run to September 30. If you are taking a winter holiday and only want to fish a day or three, check out our One Day or Short Break licences. You can buy a licence online here. From the willows on the river bank they came, aerial wisps of filament in the still air, staying airborne on tiny updrafts. They crossed the water, where the trout rose to caddis flies. The trout were splashy and noisy; some could be of takeable size, and most were enthusiastic takers of the fly. A tiny rainbow trout wriggled through the water to bite down on a barbed hook, a nuisance fish that adds to the tally but wastes good fishing time. A strand of web drifted onto my hat and its tiny pilot dangled in front of my glasses. A spider of miniscule proportions hung there, caught on its momentous voyage. I wiped it away and its sticky web tangled in my fingers – an annoyance soon dismissed.